Well, it’s that time of year again. The time of year we all look forward to from Cedar Springs to Grand Rapids, MI. The beauty of the snow stuck to the tree branches. The fresh blanket of snow across the yard that the children are playing in, and let’s not forget……… POTHOLES! That’s right…Michigan driving at its worst. As one of the leading Cedar Springs-Grand Rapids auto parts suppliers, we are here to assist you in not only your used auto parts needs, but also used auto parts education. Today, we will lay out the pros and cons between steel and aluminum rims when it comes to winter driving. Steel rims are a great choice when it comes to winter driving. One of the benefits of used steel rims on your car or truck is that they do not corrode like aluminum rims. In West Michigan the roads are littered with salt during the winter. This salt can ruin the finish on your aluminum rim as well as affect the rims ability to hold air, which then can become a driving hazard. The other benefit of steel rims on your car is their strength. Steel is a much more solid metal than aluminum. 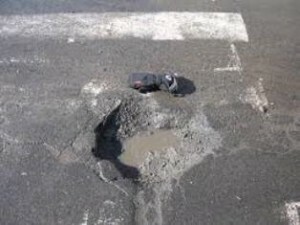 Steel rims will withstand the abuse of the many potholes we have here in Cedar Springs much better than aluminum rims. One of the disadvantages of steel rims is the fewer number of spokes. With the amount of snow and slush the roads have throughout West Michigan, used steel wheels can build up with ice and snow. Aluminum rims typically have much larger opening in the spokes allowing for easier clearing of this ice and snow. Not only does this buildup cause annoying vibrations to your car, it can cause other problems as well if the ice and snow are not removed from your steel or aluminum wheel. The other disadvantage of steel rims is they are not aesthetically pleasing to look at. Typically aluminum rims are much better looking and increase the overall appearance and resale of your used car. We hope you’ve found this information helpful! If you have any additional questions or are interested in purchasing used steel or aluminum rims, call our friendly sales staff at Premier Auto and Truck Parts or checkout our e-commerce inventory at our Cedar Springs-Grand Rapids auto parts store by visiting www.premierauto-parts.com.